According to the report, Kenya currently has 31.9 Million internet users which represents 74.2% of the entire population. This represents growth from 29.8 Million users or 69% registered in the previous quarter. Last quarter, the number of internet users declined in terms of percentages to 69% from 71% in the previous quarter owing to the revision of the base population figure used in the computation of penetration from 40.7 million to 43.0 million as per the Economic Survey 2015. Currently around three billion people in the world access the internet representing about 40% of the global population. This means Kenya has by far beaten the global average. Mobile data held pole position with 21.1 Million users from 19.9 million users in the previous quarter. This represented an 8.5% growth in data subscriptions. Internet subscriptions hit 21,628,271 users with mobile data accounting for 99% of these subscriptions at 21,511,638 users. Safaricom still leads in terms of market share with 64.1% of total market share as subscribers increased to 13.8 Million users from 12.5 Million subscribers. 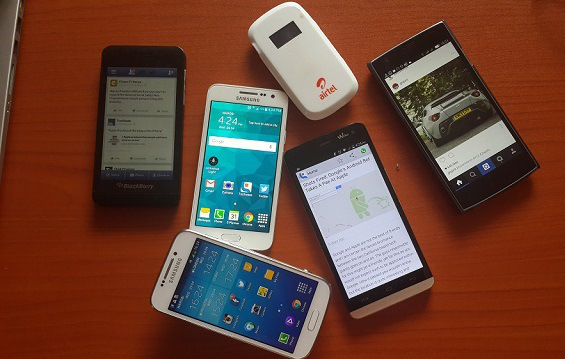 Airtel Kenya followed with 17.5% market share with 3.7 Million internet users. Orange recorded 2.8 million subscriptions with 13.4% market share while Equitel recorded 1 Million subscriptions of 5% market share. The growth in mobile internet is attributable to the affordability of mobile data bundles provided by various internet service providers. Growth of e-commerce services is also a factor leading to the increased internet usage. Social networking sites and over-the-top services such as Whatsapp, which most Kenyan internet users access through mobile devices were partly responsible for the growth. Kenyans have also used the internet for utility services such as reading news online, online banking services as well as doing research online on their cellular devices hence fueling the uptake.